Have you peeped Nick Cannon’s Twitter feed? People are going bananas on social media over the promotion of his new album, White People Party Music. And just in case you go to his twitter profile and do not recognize him its because Nick is covered in lightening make-up, in an effort to look like a Caucasian. 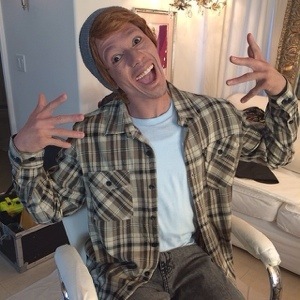 @NickCannon in "white face" is sure to cause a stir. While some find his ‘White Face’ entertaining, others found it to be quite insulting. But his recent Instagram post of him as his white alter-ego “Connor Smallnut” has a few fans calling him to be racist. It’s official… I’m White!!! #WHITEPEOPLEPARTYMUSIC #Wppm in stores April 1st!!!!! !Dude Go Get It!! !Join The Party!!!! #GoodCredit #DogKissing #BeerPong #FarmersMarkets #FistPumping #CreamCheeseEating #RacialDraft ” Bro I got drafted!! People continue to voice their opinion on Instagram . If publicity is what Cannon was going after, he definitely is getting his fair of fame. Do you find Nick’s “whiteface” to be racist?